Anterior segment optical coherence tomography has become an important tool for evaluating the cornea and anterior segment or front portion of the eye. Cross-sectional tissue images of these ocular structures can be generated in vivo, for detailed analysis. The clinical applications of anterior segment OCT are extremely important and useful. Cross-sectional images of the cornea, anterior chamber, crystaline lens and iris can be obtained in a manner which no other technology can provide. These images can be invaluable in the diagnosis and management of many anterior segment diseases and conditions such as keratoconus, corneal transplants, corneal ectasia, narrow angle glaucoma, and a number of other corneal dystrophies and degenerations. In addition to the above uses of this technology, our office uses optical coherence tomography to assist us in gaining a better understanding of many of the complex corneal conditions that we see. 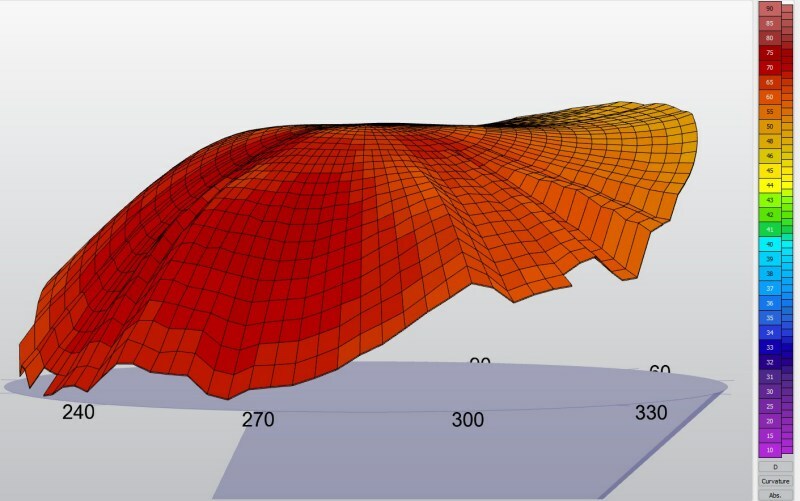 We are now using OCT to design better specialty contact and scleral lenses for our patients. Our goal is to use this and other technologies that we posses to allow our patients regain useful functional vision along with excellent ocular comfort. Scleral lens on cornea with ectasia due to LASIK. The eye has an internal pressure that helps it maintain its shape. The cornea accounts for 80% of the refractive power of the eye. Refractive surgery attempts to reshape the cornea by removing some of its tissue. When the internal pressure of the eye overcomes the strength of the thinned cornea, the result is ectasia. Typically, ectasia manifests in the inferior, or lower, portion of the cornea, and is easily observed from the side, as shown in these pictures. Ectasia may develop months or years following what appears to be a successful LASIK. The industry maintains that ectasia is rare, but the true rate is probably much higher. Advanced ectasia is often treated with cornea transplant. This is the wrong approach, but surgeons like to cut. There's an old saying: When all you have is a hammer, everything looks like a nail. Transplants typically have a lifetime of approximately 15 years, and must be repeated several times during the life of the patient. Healing takes up to a year, and there is no guarantee that visual quality will be acceptable, meaning that the patient may have a transplant and require specialty lenses anyway. Because a scleral lens functions as an artificial cornea, it is possible to restore vision while avoiding a transplant. Click on any image below to view that image in high resolution. This a small sample of patients from my practice. Ectasia can also be seen on topography. Our equipment generates a 3-dimensional topography of the post-LASIK eye. 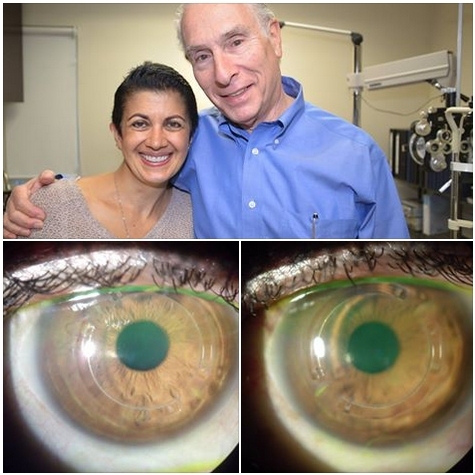 The patient below was a -18 before LASIK, meaning that an extraordinary amount of tissue was removed in an attempt to flatten the cornea correct the patient's vision. Unfortunately, this excessive thinning resulted in ectasia, a progressive bulging of the cornea under the influence of intraocular pressure. 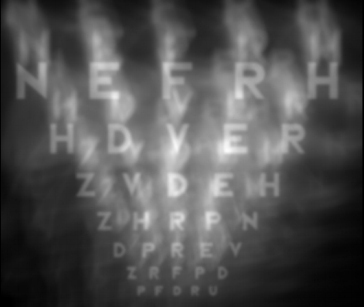 This patient's other eye had -15.00 of myopia. The 3-D topography of that eye looks pretty much the same. This patient underwent LASIK in 2000. He developed this highly distorted cornea shortly after undergoing LASIK. Sadly, this patient also developed open angle glaucoma in both eyes. It is difficult to say if the LASIK hastened the glaucoma. He is currently wearing scleral lenses which is providing him with 20/40 vision in each eye. QUOTE: "On Wednesday, the group released a follow-up report in JAMA Ophthalmology that provides more sobering information. The study suggests that the percentage of people who undergo LASIK and wind up with new visual symptoms — such as double images, glare, halos or starbursts — may be much higher. " QUOTE: "While the overall prevalence of visual symptoms decreased, a large percentage of participants with no symptoms preoperatively reported new visual symptoms postoperatively." From Jackie Tanous: In this moment, I finished my First step in my Journey with Dr. Edward Boshnick...I'm not ashamed to say I was crying when I said goodbye to him and to all his wonderful staff. As I told him, I came here 10 days ago seeing almost nothing and now, I'm going home seeing almost everything!! And as you told me...is just the beginning of our journey, a journey in which you always made me feel you were by my side, taking care of me. I have no words to say how much I appreciate that, only with capital letters...THANKS!! I'll see you in three months. God bless you. This website was created to let you know that there is hope and help available for those who have lost quality vision and ocular comfort due to refractive eye surgery. Regardless of the type of refractive surgical procedure that damaged your eyes (LASIK, Radial Keratotomy, PRK, ALK, etc.) there is non-surgical technology available that will allow you to see clearer and more comfortably once again. My specialty eye practice is devoted to the non-surgical restoration of vision to those who have undergone refractive eye surgeries such as LASIK, Radial Keratotomy, PRK and a host of other risky elective refractive surgical procedures. Since the 1980’s, when Radial Keratotomy was introduced to North America, I have helped thousands of post-refractive surgical patients who have suffered irreparable ocular damage see clearly and comfortably once again. The fact is that LASIK is not a risk free surgical procedure. Questionable studies have been done to determine patient satisfaction with this procedure going out one year after the surgeries were performed. However, there have not been any studies going out 5 years and 10 years and longer after patients’ LASIK surgeries were done. 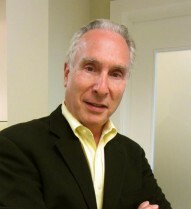 I have taken care of thousands of post-LASIK patients. The great majority of this population encountered vision loss more than a year after their surgery was done. Many encountered problems as long as 10 years post surgery. There are just too many unknowns and un-knowables about each individual eye and each individual patient. We all have unique visual needs and we all heal differently. Some of the unanticipated side effects resulting from LASK include severe dry eye, reduced visual acuity, halos around lights, glare, flare, frequently changing vision, and poor vision indoors and at night. These are just of a few of the many side effects that have been reported and observed. You only get one set of eyes. If LASIK does not go well for you, there is no way to undo the damage. Many LASIK surgeons will tell the patient that all that is needed is an “enhancement” or a “tweeking” to their eyes. Make no mistake about this. These are additional surgeries and carry with them an additional risk of further vision loss. One of the most helpful technologies used to restore vision and comfort to hurt post-LASIK patients is the gas permeable scleral lens. Scleral lenses are a unique type of lens technology designed to treat a variety of eye conditions that do not respond to any other type of technology. The new generation of scleral lenses being used today are made from a highly oxygen permeable polymer and are unique in that they fit over the compromised cornea (the front surface of the eye) and are supported by the sclera (the white portion of the eye). Because these lenses vault over the compromised (and often dry and damaged) cornea and fit under the eyelids, they are extremely comfortable and cannot become dislodged accidentally. The space between the front surface of the cornea and the back surface of the scleral lens is filled with artificial tears. This liquid reservoir fills in the surface irregularities of the cornea allowing vision to be restored in a comfortable manner. The lens and the liquid bandage beneath it protect the cornea from exposure to air and the rubbing effects of blinking. The fluid cushon beneath the lens also provides oxygen to the cornea, allowing the eye to heal (from surgery, trauma, dryness etc.). The effect creates a smooth optical surface over the compromised corneal surface. The scleral lens, in other words, creates a new optical surface replacing the distorted corneal surface resulting in dramatically improved vision. 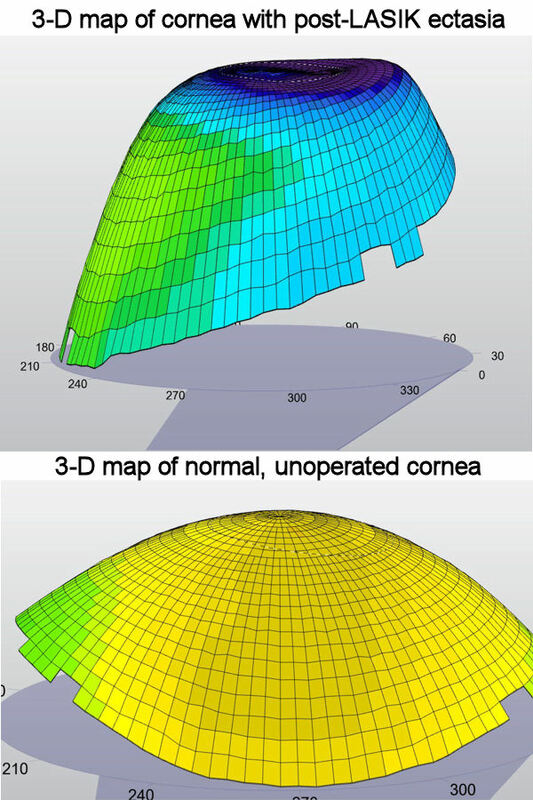 The proprietary designed scleral lenses are created using computer assisted software from Zeiss and Oculus technologies and can replace the need for corneal transplant surgery. Corneal transplant surgery has the potential for serious complications, long healing period and uncertain visual outcome. In addition the need for other invasive procedures such as corneal implants (Intacs) can also be avoided. The scleral lenses that we design are recognized as a medical and therapeutic device that can be fitted to virtually any eye shape and for any degree of visual error while allowing the injured eye to undergo a healing process. Our goal is to find and improve (and in some cases create) technologies to restore the vision and ocular comfort that you the post-LASIK patient has encountered and endured. This is our singular mission: no effort will be spared and no expense avoided in order to accomplish this goal. If you underwent LASIK surgery, the risk of floaters (also known as vitreous floaters) will always be there, even years after having undergone this surgery. When a patient undergoes LASIK, the pressure within the eye is increased dramatically for a brief period of time. This has to be done in order to create the LASIK flap. When the procedure is finished, the pressure within the eye is lowered to it's normal status. However, the internal ocular tissues can be "shaken up" during the LASIK procedure. Many years later, the liquid-gel interior of the eye known as the vitreous, can break down or pull away from the retina causing the patient to notice flashing lights and/ or floaters. If you notice this it is very important that an appointment with a fellowship trained retina specialist is made as soon as possible. A dilated fundus (retinal) examination will need to be done along with an evaluation with an instrument known as an Ocular Coherence Tomographer. This technology will allow the retinal specialist to evaluate all of the layers of the retina to make sure that the interior tissues are intact and that no retinal tear or detachment is present. If the floaters become too pronounced for you to function visually, your retina specialist may be able to help you. The main point that I want to make here is not to delay in making the appointment with the retina specialist.